For a third month in a row and for the fourth time this year, circulating coin production in the United States topped 1 billion coins, U.S. Mint data for May shows. 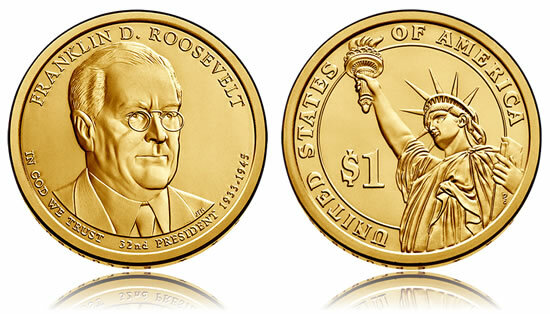 Also revealed were mintages for the Franklin D. Roosevelt $1, the last of this year’s four Presidential $1 Coins. U.S. Mint coining presses struck 1,326,800,000 coins for circulation in May, marking a 31.6% increase from April and a 22.4% increase from May 2013. Last month ranks second busiest for the United States Mint through the last 12 months, standing behind January 2014 when more coins were struck than in any month since 2007. As an always provided backdrop in our monthly coin production reports, the U.S. Mint does not decide how many coins to make for circulation. It’s the Federal Reserve that orders them from the Mint based on usage trends and coinage requests from financial institutions around the country. Lincoln cents are always the most ordered denomination for trade and commerce even as it costs the U.S. Mint 1.83 cents to produce and distribute each one. The Mint struck 799.2 million pennies in May, which is 60.2% of all the circulating coins manufactured for the month. Presidential $1 Coins, Native American $1 Coins and Kennedy half-dollars are no longer ordered by Federal Reserve Banks but the U.S. Mint continues to make them in circulating-quality for collectors. In January, the U.S. Mint produced 2014 Native American $1 Coins and 2014 Kennedy halves to the expected amounts needed for the entire year. It continues to strike Presidential $1 Coins to support the four different 2014 designs. U.S. Mint facilities in Philadelphia and Denver manufacture all the circulating coinage for commerce. In May, the Philadelphia Mint produced 705.68 million coins and the Denver Mint struck 621.12 million coins. For the January through May period, the Denver Mint produced 2,901,360,000 coins and the Philadelphia Mint struck 2,847,220,000 coins. That lifts the year-to-date total for both plants to 5,748,580,000 coins for a 8.7% increase over the 5,289,130,000 coins minted through the first five months of 2013. This year’s monthly average of nearly 1.15 billion coins places 2014 on an annual coin production pace of almost 13.8 billion coins. That would be the highest total since 2007. A tad over 11.9 billion coins were made in 2013. Franklin D. Roosevelt Presidential $1 Coin mintages are a bit higher than the previous two dollar coins honoring Herbert Hoover and Calvin Coolidge but lower than the first issue of the year depicting Warren G. Harding. Roosevelt $1 mintages total 8.68 million with splits 3.92 million from Denver and 4.76 million from Philadelphia. It seems totals are unlikely to change from here. If that is the case, 2014 Presidential dollar mintages end at 35.14 million which is 5% higher than last year. So far, just two of this year’s Presidential $1 Coins have been released. Rolls, bags and boxes of Herbert Hoover $1s go on sale next week, June 19, and U.S. Mint products with Franklin D. Roosevelt $1s debut sometime in August. In comparing totals by coin design from the overall production figures by denomination, there is one difference. Mintages of America the Beautiful Quarters are higher by 308.2 million. These are likely most of the Arches National Park Quarters which just entered circulation on Monday, June 9, 2014. Coin production figures in this coin news article are based on data aggregated from the U.S. Mint webpage at: http://www.usmint.gov/about_the_mint/?action=coin_production. We have gotten one Olympic and one Chickasaw so far in change this year. Looks like the Shenandoah D will be the new throwaway for the series. All others are apparently being hoarded or never released yet by the fed. Still no Utah D in circulation of the statehoods. And none of the territories from 09. Once again either still in the vaults or being picked out for the grandkids whitman folders. It’s not the ATB quarters are being withheld or even hoarded, there just aren’t that many of them compared to the total production of clad quarters. Over the entire mintage of the 2010-2013 quarters makes up only 3.7% of the total production from 1965 to present (about 73 billion quarters). That means only about 1 in 27 quarters will be ATB designs and 2013 is almost 2% of that 3.7% total. ATB designs to date have not even exceeded the first year’s mintage of State Quarters. Working as a cashier, I’ve seen all the designs (though not all the mint varieties), including the 2009 ones. They too had a severe drop in production. Quarters from 2009 to present appear infrequently, but they appear enough to show they are out there. That makes sense I guess. I see way more nasty looking 65’s than I do ATB quarters, pretty remarkable since they are almost 50 years old. When you think about it, the mint had to replace the entire national quarter inventory back then. As we go to more of a cashless economy, one has to contemplate whether even 100 million will seem staggeringly high for future circulatingcoin mintages. Where do all of thebillions of pennies go, China for conversion into fake Rolex watches and knockoff Morgan dollar planchets? Another reason that older dimes and quarters haven’t worn out is simply that cupronickel is a lot more durable than coin silver. I was a kid (and budding collector) when silver production ended, and even then the Mint was forecasting that clad coins would have a much longer lifespan. I’m only now starting to see a level of wear, mostly on ’65-’70 dates, that would have been common on silver coins after just a couple of decades.